Investor pitch competitions can be a great way to be seen by potential investors, build your network and, if everything aligns well, win some prize money for your startup. Last night the winner of the Women Founders Network 2017 Fast Pitch competition was Sashee Chandran, the founder of Tea Drops. I was ecstatic because I was her pitch coach. As a coach and trainer, there’s nothing more gratifying than when you see the people you work with do what it takes to excel and reap the rewards of their hard work. Tea Drops makes a great product that hits on many levels – it’s delicious, healthy, organic, fair trade, made in the USA, convenient, and visually appealing. Clearly, Sashee was off to a great start before she began pitching investors. The other CEOs who pitched their companies last night were also impressive. Quite often, even the people who don’t win pitch competitions, but pitch very well and have a great business concept, receive funding from investors who saw them pitch. If you’re planning to enter a pitch competition, assume the other pitchers will be great and prepare thoroughly so that no matter what you will have no regrets. 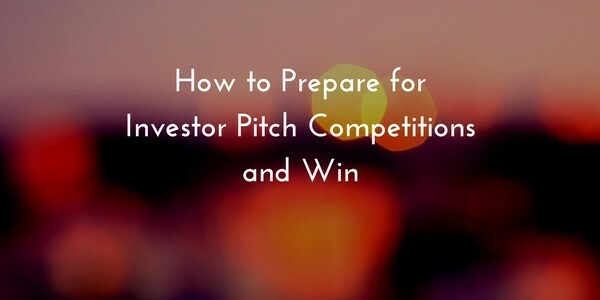 Here are some tips to ace investor pitch competitions. There’s more involved in the process, and success comes from how you complete each step, but this will provide a roadmap to get you started. These are the steps I took Sashee through to help prepare her for the competition. Refine and streamline your pitch deck. Be sure your deck answers the major questions that will be in the minds of your audience in your presentation. Address the problem, solution, market size, potential, competition, financials, marketing plan, team, and how you use the funding. Have your pitch deck reviewed by someone outside your company. This is always where I begin when people come to me for pitch coaching. When you’re too close to something, it’s hard to see it clearly. Having your pitch deck reviewed by someone who has looked at hundreds or thousands of them with a professional eye will help you to see where the holes are and what needs streamlining. Rehearse delivering your pitch until it is IN you, and continue elevating your delivery. Most people underestimate how many times they should rehearse a pitch or presentation. My recommendation is to rehearse it as many times as it takes for you to run through it without wondering what comes next. When you can deliver your pitch as if you are fluidly telling a story that you know inside and out, your mind won’t be focused on trying to remember: you will be more fully present in the moment and able to share your passion. Get feedback on your delivery. You might video yourself and watch your video to try to improve your performance, but having a trusted advisor give you feedback on your body language, word usage and other elements of your communication will be even more helpful. When I prepare clients for investor pitches or pitch competitions, I provide feedback and recommendations on all aspects of their delivery so they show up exuding confidence, authority and warmth (a very winning combination). In most pitch competitions, after you have delivered your pitch there is a brief question-and-answer session. Prepare responses to every typical question and tough question you might be asked, and rehearse delivering them. Savvy investors will want to know that you’re able to objectively see any potential roadblocks and have plans to work around them. Take good care of yourself and block out several hours prior to the pitch competition. Be sure to leave time to clear your head and relax before the pitch competition. Try to avoid dealing with draining tasks that can be dealt with another day. Conserve your energy so you show up centered, joyful and confident. Take the stage and shine! From the moment you’re in view, you’re being watched. Walk on stage (or to the front of the room) with confidence and positivity. Take a beat to center yourself and then begin. If you’ve done the work, the very least you will do is your very best. If you want help preparing for investor pitches, a pitch competition, or other presentations, click here to arrange a complimentary consultation with me.